This is my first ever English blog, I will show all of my bears that I create recently in here. Hopefully everyone can enjoy this blog! He is a "Pooh Looking" One of a Kind artist bear. He is 19inches / 48cm tall when he is standing. He wears whole set of hand knitted Santa outfit, and of course, with his Santa hat. He is made by beige colour Alpaca with similar colour suede. He has black glass eyes and black Perle Cotton embroidered nose with few strokes of gold Perle Cotton. And his nose is also been shin by nose shin and a little bit touch of glitter nail polish. He has 5 ways lock nuts/disc jointed and filled with Australian wool and stainless steel shot for lovely heavy weight. 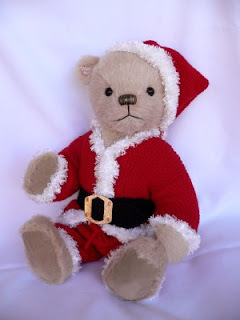 Santa Claus comes with a Cumai Bear's pin on his right ear and a tag with all his details. He is currently on eBay right now and start bids from $120. Christmas is on its way, and only 10 weeks to go! Be ready earlier for this sensational time!